I arrived in Toronto 6 years ago and fell in love with all things Canadian—not just my husband! Toronto is a great city to live in, hip, vital, creative; moreover it has been my privilege to make friends with great Canadian illustrators like Anita Kunz, Blair Drawson, Gary Alphonso and Sylvie Daigneault. However it wasn’t until I visited Algonquin Park that my eyes were truly opened to the real nature of this vast country. It has been many centuries since the UK had large tracts of virgin forest complete with indigenous wildlife therefore I am used to a tame, though splendidly picturesque, countryside where bears and wolves were hunted to extinction many centuries ago. My goodness, is Canada different? I have become fixated on canoes. My first attempt at paddling across a quiet lake was pure delight—really surprising as I am not ‘sporty’ at all and am quite terrified of water! In my mind’s eye I have returned to that image over and over again—the rippling lake, the overhanging trees perching precariously on granite cliffs—so much so that I wanted to write about it, hence ‘The Red Canoe’. My story takes us back in time a little to when a young boy and his canoe explored the lakes and waterways together—and rightly or wrongly, I have written it from the canoe’s point of view as it lies neglected and disintegrating long after the boy has gone. I wanted a sense of Canada’s history—young as it is—as I am fascinated to learn about the country that has become my home. So far I have produced only three illustrations but my story is complete (though unedited) and I have attached it here in full. So far I have only written for myself, lacking the courage to show my stories to anyone, but I so believed in this story that I submitted it to Canada Writes and (to my utter astonishment) was placed within the 12 runners-up! For the artwork I wanted to invoke not only the beauty of the natural surroundings but also a sense of time long past so my first piece was an exercise in choosing a colour palette as well as deciding how to depict the boy. I made use of quite a straight forward drawing technique so that the medium would not interfere with the viewer’s participation—sometimes the artwork can distract attention rather than enhance. I would have dearly loved Gary Alphonso to illustrate this story, as his work is so quintessentially Canadian, but it was a bit much to ask for such commitment when as yet I have no publisher. My talented husband Danny has been called upon yet again to do the design work and has produced a beautiful cover that hearkens back to simpler times. Some time ago, when still in advertising, Danny worked on the ‘Beaver Canoe’ account and we both thought that the graphic approach he used then was a good jumping off point for the overall look of ‘The Red Canoe’. The interior of the book continues with the soft, natural palette and will include rough pencil sketches of plants and animals alongside the text—I think this helps to give it the old-fashioned appearance we’re looking for. Danny’s use of an overall background colour to soften the stark whiteness of the pages gives the whole thing a gentle, atmospheric look. The old boathouse stood gamely in the weak winter sun, it’s wooden sides creaked and groaned as if it shivered in the frigid air. Slivers of light squeezed through its missing planks and lit on the dusty webs and shrouded shapes lying in the shadows. Behind the old wooden chairs and under the rusted tools, wrapped in stiff folds of canvas like an ancient Mummy, lay the old red canoe. Turned keel up it lay silent and forgotten, its fragile ribs grown brittle with age, its once gaudy paint faded and peeling. Generations of mice had nibbled holes in its canvas sides while the fall before last a family of raccoons had taken up residence under it’s hull, its sheltering planks providing safety and warmth through the harsh winter months. Time moved slowly, days turned into weeks and weeks into years and the red canoe slept on. And as it lay there, it dreamed. It remembered the summer day, long ago, when it left the place where it was built, when lifted from the ranks of fellow canoes, red and green and yellow, it was loaded onto a high wooden cart, its glossy red flanks gleaming in the sun. Swaying to the rhythm of the big horse’s steps the cart rattled along the rutted lanes till it came to the cottage by the lake. Remembered also the boy with the smile on his face who couldn’t wait for it to be offloaded but jumped right into the cart to be the first to touch it and stroke its sides. From that moment the boy loved his canoe. The very first day they launched into the lake together and every sunlit day after that. 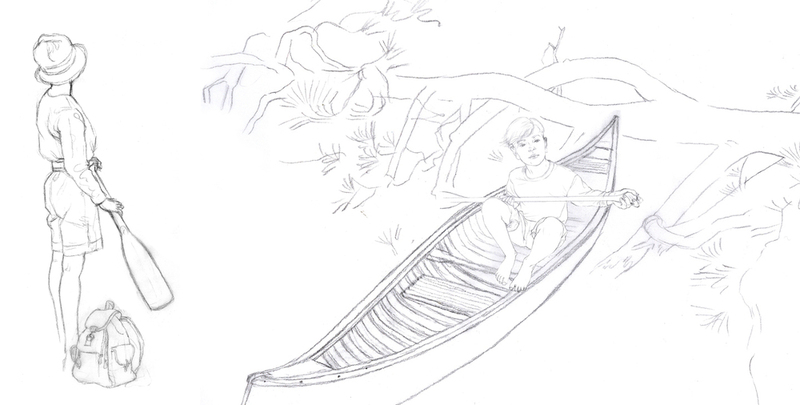 The boy was quick to find his balance kneeling in its belly; the canoe wondering at the ripple of cool water against its sides weighed the feel of the boy balancing in its bows. Together they explored the mysterious ways of water, how it rippled playfully on breezy days rocking them gently on its waves then bounced and splashed down the tumbling creeks sending them rushing madly through the rocks. They learnt of its strength as it pushed back against their paddles or lifted them effortlessly on a wave, and that it had moods that depended on the weather. Together they explored the lake with it rippling, deep green water finding all its hidden bays and shores and laying claim to each one. Camps were built and fires lit, on warm nights a bed was laid under the stars. As each summer day rolled into the next they learnt the secrets of the woods and waterways—where the beaver built it’s lodge and how many cubs were born, where the moose brought its calf down to drink in the cool evenings and where the heron liked to dive. They learnt the best spot to lay down the lines and fish, drifting dreamily under cloudless skies aware of how lucky they were. Each year the boy got bigger and stronger and they travelled further and further, the canoe’s belly packed with supplies. They left behind the stories and games of childhood, the youthful heroes—Rob Roy and Davy Crockett, Robin Hood and Ivanhoe, and learned instead to portage between the lakes and navigate long distances by compass and stars. Summer at the lake was a magic time where a boy could grow strong and tall with sturdy limbs and a level head. Time passed and the seasons changed; each fall the boy lovingly repaired any damage to the red canoe, cleaning and waxing repairing any scrapes, then carefully he would wrap it in soft, dry canvas tucking in the corners and making it tight. Snug and safe in the boathouse the canoe would dream away the winters while ice froze the lake and hung from the trees, while the brown bear slept in his cave and hungry wolves howled through the woods. Each spring the doors of the boathouse would creak open and the boy would carry the canoe into the open removing its covers allowing the sun to warm its flanks, waking it from its long sleep. It should have gone on forever. But one year tales from abroad left the boy restless and unhappy; a War was being fought in far off lands by other boys just like himself. He could not settle to roam and fish when other boys were marching into battle, laying down their lives like heroes of old; he could not ignore the stir of his blood and dreams of chivalry and bravery in the face of death. So he went away. The red canoe, packed away in the boathouse, waited for the boy to return. Waited for the spring day when the doors would open and the boy would carry him out into the sunshine once more. But the boy did not return. Like so many other boys in those terrible years the boy was gone forever. The red canoe waited a long time. It waited while winter turned into spring and still no boy; he waited as many winters turned into more winters. Endless years went by, the world beyond the boathouse changed in so many ways; electricity and indoor plumbing, radios and talking pictures, skyscrapers and telephones. The lake and the forest continued the endless cycle of birth and rebirth, while inside the canoe slept on, the dust settling on its painted skin, and mice making nests in its ribs. The last winter had been the hardest of them all. The old boathouse offered almost no protection against the ice and snow and the canoe felt its life fading slowly away, its memories so old and faded they barely existed. Patiently it had braced its old cedar hull against cold and decay, the sharp little teeth, the clambering paws but now it felt the last of its strength seeping slowly into the shadows. It tried once more to remember the boy’s smiling face and the warm summer lake but it all seemed too much effort. The old canoe lay as cold as a stone, the last memory fading away when the boathouse door opened, creaking loudly on its rusty hinges. There was a lot of banging and clattering and voices raised in excitement, A little boy’s voice shouted “Dad! What’s this?” and the old canoe felt itself lifted out into the sunshine while eager hands busily removed the dusty old canvas. “It’s a canoe Dad! Look at it! It’s beautiful Dad—can we fix it?” “Sure son,” came the answer “Sure we can.” And the red canoe felt the warmth of the sun on its canvas skin and loving hands stroking its side once more and it knew that summer would return once again.